New York City’s most eclectic film festival, “New Directors/New Films,” showcases features, documentaries and shorts by directors and writer-directors who are just beginning their careers. Comprised of debut films or “sophomore” efforts, ND/NF represents the chance for audiences to discover a new artist, and to see a movie that may not receive theatrical distribution. Opening night is Wednesday, March 15th, at the Museum of Modern Art, with Geremy Jasper’s Patti Cake$ (U.S.A.). Twenty-nine feature-length films and two programs of short films, from over two dozen countries, screen through March 26th; all the movies at the 46th Annual ND/NF will be shown at both the Museum of Modern Art and the Film Society of Lincoln Center. A still from el Futuro Perfecto, featuring star Xiaobin Zhang. 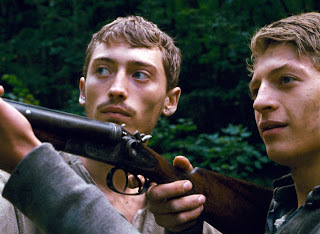 Several features meld fiction and documentary, such as Alessandro Comodin’s i Tempi Felici Verranno Presto (Happy Times Will Come Soon, Italy/France), in which two stories are set in the same forest (in the Friuli region), in two different eras, and Locarno winner Nel Wohlatz’s el Futuro Perfecto (The Future Perfect, Argentina) that explores language as a vehicle for self-realization. (See my Facebook post for more on "el Futuro.") Both are beautifully photographed and well-edited, yet they have very different appeal. Comodin’s sophomore effort is for viewers who appreciate abstract narratives, while Wohlatz’s debut has a recognizable arc. 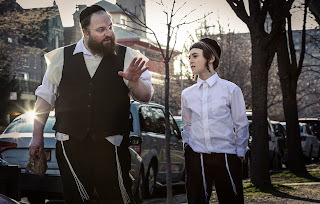 Menashe and his son in Weinstein's Menashe. Joshua Z. Weinstein’s impressive debut narrative feature Menashe (U.S.A.) is set in a Hasidic community in Brooklyn, its eponymous hero a recent widower whose emotional maturity is barely a match for his 10 year-old son. The rules of Menashe’s sect prevent from him living with the boy until he remarries—but the lonely supermarket worker does not want another wife. He was 22 years old when his father sent him to Israel to meet his first bride. Menashe does want to be with his son, but for the time being the rabbi places him with Menashe’s brother-in-law, a successful businessman. In the subtext of Weinstein’s entertaining film, there lies a gentle critique of Hasidic life, including the limited role of women in these communities. On the other hand, Menashe provides dimension to those mysterious men in black coats and large hats, especially for non-Jewish audiences. A production still from Quest, featuring (L to R) daughter PJ, her mom, Christine'a and her dad, Christopher. South Philadelphia is the setting for Jonathan Olshefski’s absorbing and skillfully made first documentary, Quest; it follows the Rainey family through eight years of struggling to make ends meet. 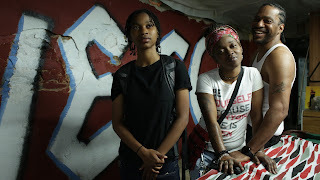 Like Weinstein, Olshefski is overturning stereotypes, in this case, negative portrayals of African-Americans living in the equivalent of East New York or Crown Heights in New York City. Parents Christopher (aka “Quest”) and Christine'a, are devoted to their children, and toil at several jobs to support them, as well as sustain Christopher’s home recording studio. Christine'a works at a homeless shelter, and at first is content to care for her young daughter, and to bolster her husband’s musical pursuits. Over the course of the documentary the Raineys confront trials that test their commitment to each other, and while there are tense moments, for the most part, they do what every other family does to stay together—they weigh what is in everybody’s best interests and accept the circumstances that limit their choices. For those who revel in neurotic, 19th century female literary characters in the French tradition (think Gustave Flaubert and de Maupassant), New Directors/New Films includes in its 2017 line-up William Oldroyd’s debut film, Lady Macbeth (U.K.). Not for the faint-hearted, or the feminist, the movie nevertheless features several good performances by young actors, including that of Florence Pugh in the lead, and Naomi Acki in the role of her maid. The adapted screenplay is from Russian author Nikolai Leskov’s 19th century novel, published a decade after Flaubert’s "Madame Bovary." For more information on the festival, visit its website: https://www.filmlinc.org/festivals/new-directors-new-films-2017/.